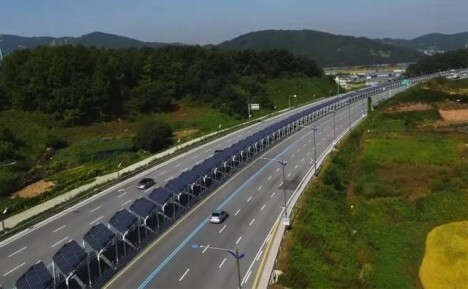 Connects the towns of Daejeon and Sejong (around 20 miles apart) a few hours from the capital city of Seoul, South Korea, this two-lane bike path provides weather protection for bicyclists (from sun and rain) but also powers the lights along the highway for both bikes and cars. A similar system could potentially even be tapped by rural houses in remote areas along more off-the-grid routes. There are many possible critiques of this approach, not least of which involve concern for the safety of cyclists, but since many already bike illegally along the shoulders of high-speed freeways this at least seems like a step up for their well-being. You can see a good portion of the span in the drone-captured video below – watch that first and then decide whether it looks like a good place to ride. With fewer inter-city intersections to contend with, bikers are able to use the route without too much interruption and exit it at periodic intervals. 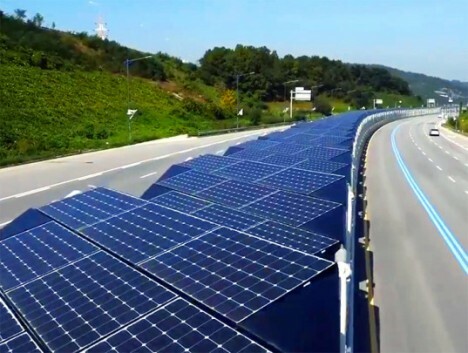 Whether this would be accepted somewhere like the United States, where pollution concerns and safety standards might pose hurdles, is another question – for now, it is live along one stretch in South Korea and if it goes over well may spread within or beyond that country. See more in Energy & Power or under Science. April, 2015.